I also have a feeling that there are more people out there who would like to know about Woody and his ideas. Being that we don't buy or solicit mailing lists, the only way we can expand is through word of mouth. Please help us build a network of people with common concerns by telling your family members, friends and coworkers at your company or organization about what we do. And if you yourself would like to us to keep in touch with you, then join our mailing list. 2002 celebrates Woody's 90th Birthday! So many concerts and events took place around the world we couldn't list them all. My brother, Arlo, continues the festivities with his own family style tribute to be held at Carnegie Hall November 30th. Guests include Pete Seeger, grandson Abe Guthrie, granddaughter Sarah Lee Guthrie with Johnny Irion, The Dillards and The Mammals. Arlo will release a new CD of all-Woody songs, 32 Cents, titled from the infamous postage stamp! Woody made the cover of Dirty Linen Magazine for his birthday (July 2002) with a cover story on his artistic (and genetic!) legacy. Additional stories on Arlo, Abe, Sarah Lee and myself! were included in the feature. Granddaughter Anna Guthrie Rotante kicked in an incredible birthday present - a free full page ad for the Foundation and Archives appeared in the May 11-17th issue of TV Guide courtesy of their PSA department. Additional birthday coverage appeared in articles and radio documentaries from around the world including Austria, Denmark, Scotland, Slovenia, Sweden, Italy and France. The Woodstock Film Festival also celebrated Woody's 90th birthday this fall as they honored Haskell Wexler, Academy Award winning cinematographer of the autobiographical film Bound For Glory. A birthday concert featuring Happy Traum, Eric Weisberg, Jay and Molly Ungar, Ellis Paul, Hohn Herald, Amy Fraydon, the Vanaver Caravan, and Guthrie tribe: Arlo, Abe, Sarah Lee and Johnny Irion was held at the Ulster County Performing Arts Center in Kingston, NY and we were happy to help organize a panel discussion on the relationship of film and politics with the guys that know... Wexler and, Executive Producer of the film, Harold Leventhal. Harold, longtime business manager of Woody, The Weavers and so many other folk legends, also received the Lifetime Achievement Award from the Folk Alliance this year. Congratulations to our beloved mentor and lighthearted leader! Grand Ole Nashville celebrates Woody. The month of January 2003 will belong to Woody. Concert promoter Kari Estrin has organized a month-long celebration of events to benefit the Archives which will take place all around the town. The performances, book signings, gallery showings and school programs will culminate with a grand ole concert at the Ryman Auditorium on Feb. 5th and usher in the Folk Alliance Conference to be held in Nashville Feb. 6-9. Check our website for scheduled performers and events....there's too many to list here! Woody's Art Book.... it's in the works! I am happy to tell you that I have begun working with award- winning Print Magazine designer Steven Brower on what I know will be a real coup for so many of us who love Woody's artwork. Sparked by the tremendous reaction to Woody's art shown for the first time in the Smithsonian Institution's traveling exhibit, we have begun collaborating on a full colored book of Woody's artwork! 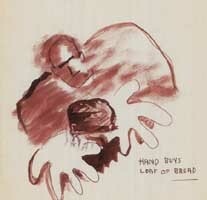 To be included will be; the original Bound For Glory pen and ink series, political cartoons, topical art, children's lyrics watercolors, illustrated lyrics and more. Woody Guthrie Legacy Records. Our new label will begin releasing rare and historic recordings from the Archives. Our purpose will be to make recordings from the Archives available to historians, students, journalists and the public at large. Our first release, recorded in 1949 on wire, is the only existing recording of Woody in live performance with an audience. Marjorie Guthrie hosts this intimate show. 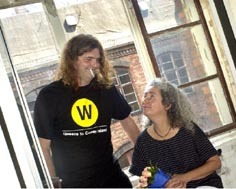 WGL Records will be sold directly through our website and all proceeds will go to support further Archives activities. More Music from the Archives. Following the joy of making Mermaid Ave. Vol. I and II with Billy Bragg and Wilco, we've continued on to new projects creating music for lost and unpublished lyrics from the Archives. 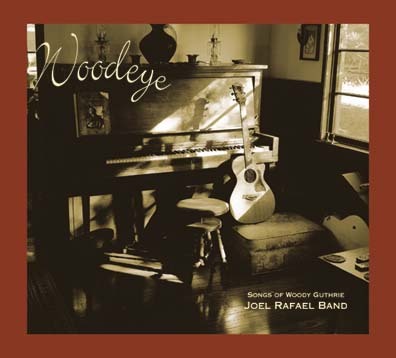 The Joel Rafael Band went even further and recorded a whole CD of Woody cuts! Woodeye includes the new lyric Dance a Little Longer. I've listened to this CD over and over, and it just grows in beauty. Singer/songwriter Ellis Paul just released his new CD The Speed of Trees (Rounder) which includes another lyric, God's Promise. Ellis picked a real winner which sheds light on Woody's spiritual side. (Ellis will be performing with Austin's Jimmy LaFave and Slaid Cleaves on their Ribbon of Highway-Endless Skyway Tour, their tribute to Woody's songs and music). Punk bands Blackfire and Dropkick Murphys were also invited to look through the lyrics for material for upcoming albums. And Cathy Fink & Marcy Marxer were so touched by Billy Bragg's music to Birds and Ships, that they've included it on their new CD Postcards. Bassist and Rat Dog artist Rob Wasserman and I continue our recordings of poetry and prose from Woody's notebooks and diaries. Our most recent cut mixes three masters of their own turf: Rob, Studs Terkel and DJ Logic. At my invitation, Berlin songwriter Hans Eckardt Wenzel recorded the first ever German language CD of Woody songs. TICKY TOCK, due out in January, contains 10 new lyrics from the Archives as well as new arrangements of some older ones. New titles include: Ticky Tock, Every Hundred Years, Blue Eyes, I Like To Stay Home with Daddy, Jinga Linga, Been Out On An Ocean Trip, He and She and If I Were Everything on Earth. The CD will be recorded in English as well. I had the opportunity to be in the studio with Wenzel this summer in Berlin and we even appeared on nationwide television together. And, before you find out from someone else, I'll tell you myself...he made me sing on 2 tracks. In German. Click here for a TV news report from Berlin with Wenzel and Nora. The CD will coincide with the release of a new German/English language Woody Guthrie Songbook (Palmyra) which contains over 250 lyrics, photos, and artwork with commentary by Lou Reed, Wenzel and others. Reknowned German translator, Harry Rowahlt, worked on the translations with additional contributions from Wenzel and German radio producer and Folker! magazine editor Michael Kleff. Daddy O Daddy! (Rounder) was released last fall to huge critical acclaim with artists, Taj Mahal, Kim Wilson, Billy Bragg, Syd Straw, Joe Ely and Jimmie Dale Gilmore, and Ramblin' Jack Elliott performing new and old Woody's kids songs. Kim Wilson's take on New Baby Train inspired children's illustrator Marla Frazee to create a new book for release next year (Little, Brown & Co). 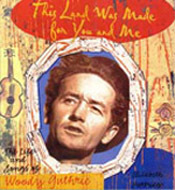 This past spring, award-winning author Elizabeth Partridge published a brilliant new biography, This Land Was Made for You and Me, The Life and Songs of Woody Guthrie (Viking) using primary research material from the archives. Partridge's book was just nominated for the National Book Award. 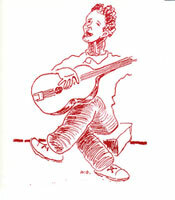 Karen Mueller Coombs gave us Woody Guthrie, America's Folksinger (Carolrhoda) for young children. And There Ain't Nobody That Can Sing Like Me by Anne E. Neimark (Atheneum) was also just published for elementary school aged children. Historic author Ed Cray's long anticipated biography will also be published this coming year. (That's what I heard!) Folk artist Kathy Jakobsen's best seller This Land Is Your Land (Little, Brown) is now in it's 3rd printing. The new edition includes a CD of Arlo and Woody singing 9 tracks. This book is so special, it's going to be around a long, long time. Thank you to all these writers for getting Woody's message out to the next generations! New Curriculum for Elementary School Teachers: And for all you teachers out there, we recently launched a teacher's curriculum written by Theresa Kubasak for elementary school children. Theresa interned at the Archives this summer and we are excited about this new service to educators. Check it out! 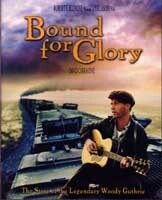 Documentary Films: Some interesting and important new documentaries are in the works that relate to Woody's songs in various ways; 1913 Massacre (the story behind the song), Broken Sky (the story behind Plane Wreck at Los Gatos/ Deportee), a film based on the Sacco and Vanzetti events and The Ballad of Isaac Woodward (included in a film about Orson Wells). And finally, the Smithsonian Institution's traveling exhibit THIS LAND IS YOUR LAND: THE LIFE AND LEGACY OF WOODY GUTHRIE, which reached thousands of people throughout the country in its three-and- a-half years of touring, made its farewell appearance at Oklahoma City's Historical Society. Unbelievably, the opening of the exhibit sparked the discovery of Woody's mother's previously unknown gravesite! We have arranged for the museum to continue to display a significant part of the original exhibit and will collaborate with them on future educational exhibits and programs. We are touched that Oklahoma has reclaimed and embraced her native son. Okemah, OK held its 5th Annual Woody Guthrie Free Folk Festival this summer and Texas became the next-in- line family member with the official opening of its Pampa's Tribute to Woody Guthrie Center.